Below are examples of typical possible results for when you first start using XFT. 1. Fuel economy will immediately increase upon initial use and continue to increase until it levels off. This happens in a large percentage of vehicles . 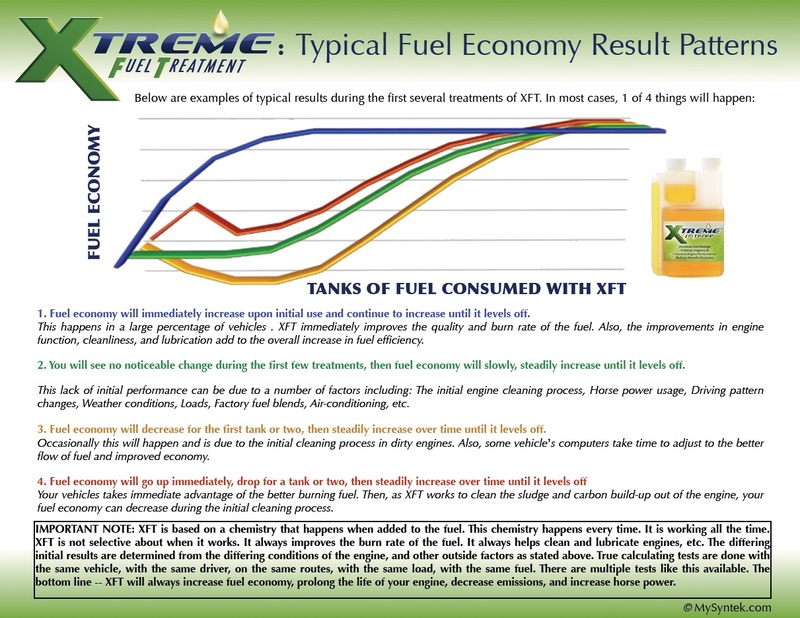 XFT immediately improves the quality and burn rate of the fuel. Also, the improvements in engine function, cleanliness, and lubrication add to the overall increase in fuel efficiency. 2. You will see no noticeable change during the first few treatments, then fuel economy will slowly, steadily increase until it levels off. This lack of initial performance can be due to a number of factors including: The initial engine cleaning process, Horse power usage, Driving pattern changes, Weather conditions, Loads, Factory fuel blends, Air-conditioning, etc. 3. Fuel economy will decrease for the first tank or two, then steadily increase over time until it levels off. Occasionally this will happen and is due to the initial cleaning process in dirty engines. Also, some vehicle’s computers take time to adjust to the better flow of fuel and improved economy. Your vehicles takes immediate advantage of the better burning fuel. Then, as XFT works to clean the sludge and carbon build-up out of the engine, your fuel economy can decrease during the initial cleaning process.